A hand can be a terrifying thing. A wielder of weapons, a weapon itself, or the final reminder of a last goodbye. But that appendage becomes even more horrific when it belongs to long dead corpse known to have dabbled in the occult in his life before being mummified. And now…the mummy wants his hand back. Author Nathan Cabaniss mixes hints of horror with action and adventure and even a touch of humor to craft the perfect Pulp blend in THE MUMMY’S HAND AT THE CENTER OF THE UNIVERSE, a Single Shot Signature release from Pro Se Productions. 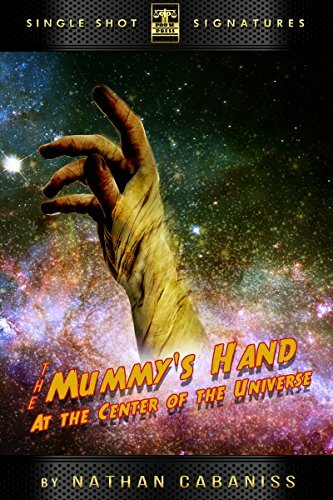 With a cosmic cover and logo design by Marzia Marina and Antonino Lo Iacono, THE MUMMY’S HAND AT THE CENTER OF THE UNIVERSE is available now for the Kindle on Amazon at https://www.amazon.com/dp/B07B4NCT83/ref=sr_1_1?ie=UTF8&qid=1519870493&sr=8-1&keywords=the+mummy%27s+hand+at+the+center and Pro Se’s own store at www.prose-press.com for 99 cents. This book is also available on Kindle Unlimited, which means Kindle Unlimited Members can read for free.